Tax professionals call them the “Shoebox Business People.” These are the business owners who show up at tax time with all the information for their business tax returns in shoeboxes. 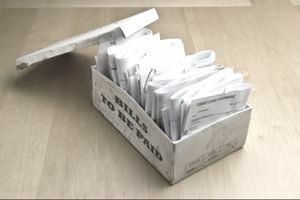 The tax preparers must sort out the receipts and bank statements from the shoeboxes and try to figure out the taxes for the business so a tax return can be prepared. Sometimes these Shoebox Business People come with an income printout, but mostly they just have their bank statements (un-reconciled, of course). Because they are unorganized, these business people must pay more for their business tax return than someone who walked into the office with a printout of the balance sheet and income statement at the end of the year. 1. Your tax return takes much more time to prepare, which means the cost of the tax return increases. 2. You may miss many deductible expenses because you have lost — or never received — the receipts you need to back up the expense deduction. 3. Other business expense deductions may be lost because you didn't record them. For example, driving expenses must be captured at the time of the travel. You can't just make up business driving trips at the end of the year. 4. In addition to tax issues, not being organized can cause you to lose money on a daily basis. For example, operating your business without knowing your cash flow status means you may be hit with overdraft charges and other bank fees. 5. Not knowing your overall financial position may cause you to lose opportunities to buy at good times and invest to take advantage of good returns. Tax professionals will tell you there's a definite correlation between the financial health of the business and the state of their business records. Do You Want to Avoid Being a Shoebox Business Person? 1. Get an online accounting system and keep it up to date. Put all the accounts in the note above in that system. Use their links to your accounts and get the automatic updates, so you don’t have to do manual input. 2. Set up a way to capture every single transaction (financial event) when it happens. I send every online receipt to my bookkeeper via email, telling him which category to put it in. Then I can forget it. Another easy way is to keep all those records online, using Evernote. You can send an email to your Evernote account. Don't forget small transactions; record them in a petty cash system. 3. Put a logbook in your car and keep track of business mileage. Make a note every time you drive anywhere for business, including the date, miles driven, and business purposes. 4. Every month, review your expenses and reconcile your business bank account. It’s not that difficult. With an online system, it’s almost done for you. Make sure that all expenses are correctly categorized. If an expense was for a business meeting at a restaurant or other location where you paid with your business debit or credit card, note the business purpose and who you were with on the receipt (there’s usually a place for notes). If you see something strange, follow up on it. Only you can do this, and it will only take a few minutes. 5. Before the end of the year, do a quick review of the year, noting anything strange, any expenses out of line with expected. Add all those business mileage expenses from your log book. Prepare a list of home office expenses. And you're done! After the first of the year, when you have all of your end-of-year bookkeeping done, you can walk to the tax preparer’s office with a memory stick. Or, better yet, you can email the files directly to your tax preparer.